Virtually all of the dive watches I have reviewed have been just that, dive watches. 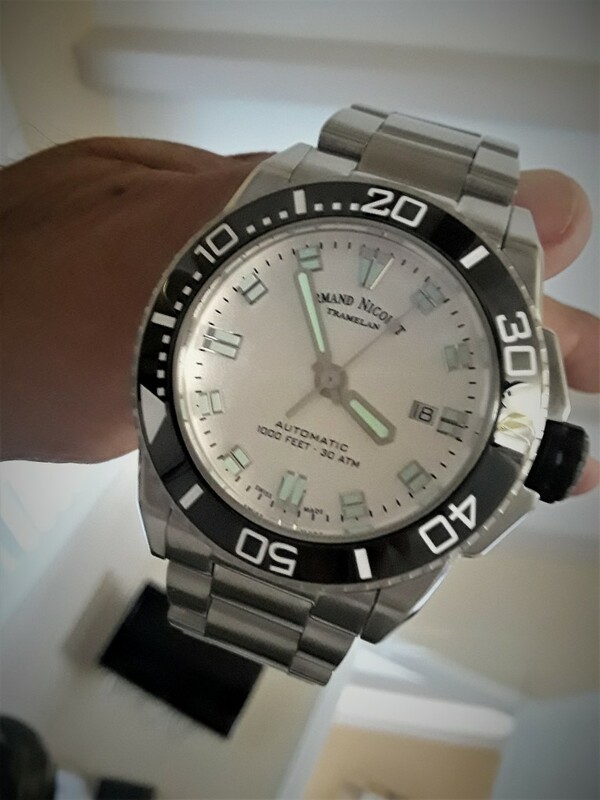 For this review I have a dive watch that is different, which I classify as a dress dive watch. 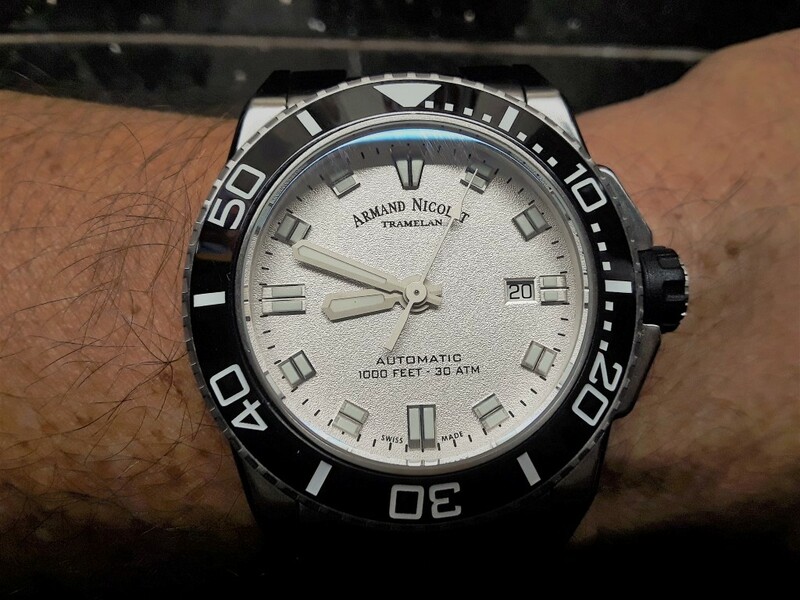 Armand Nicolet is an approximately 140 year old Swiss watch company that was sold by the founder’s son in 1988 to Rolando Braga of Italy. 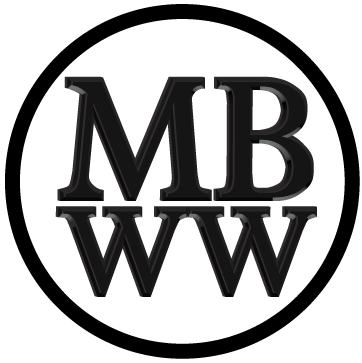 The company had been a finisher of complicated Swiss movements for other Swiss watch brands until that time. With new ownership, Braga decided to close his watch assembly factory in Italy and move to Switzerland. 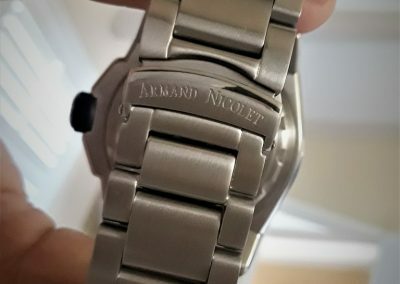 The decision was made to manufacture Armand Nicolet watches with either vintage movements upgraded to current Swiss standards or with modern ETA or SELLITA based movements modified by the company. The AN branded watches were first introduced in 2000 at Basel Fair. 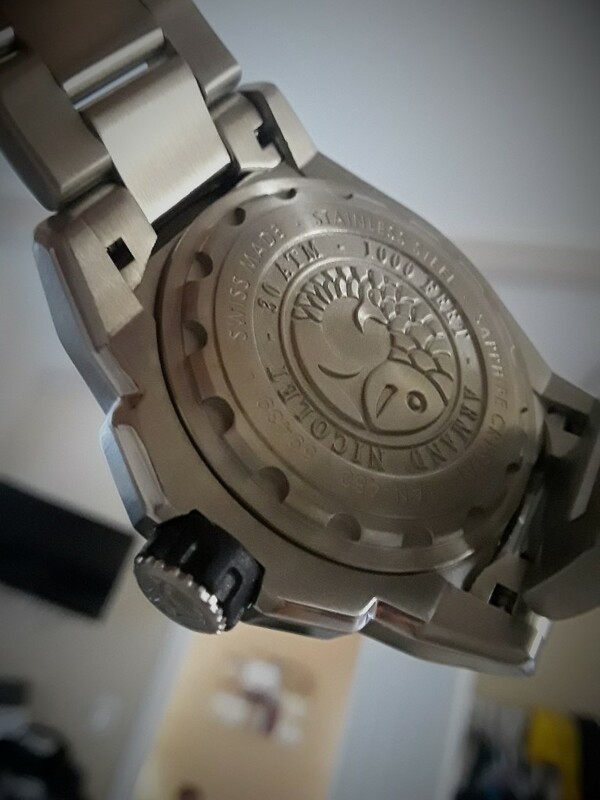 For this review I have a watch from the recently introduced JS9 line. This particular watch model is completely 316L stainless steel with a black ceramic bezel, slightly domed sapphire crystal and a sandblasted finish silver face with 12 bisected lumed silver indices, 60 printed minute second markers and lumed silver hour and minute hands in what appear to me to be in a modified plongeur style. The second hand is more like a tapered needle with an arrow tip. All the hands are the right length in my opinion. 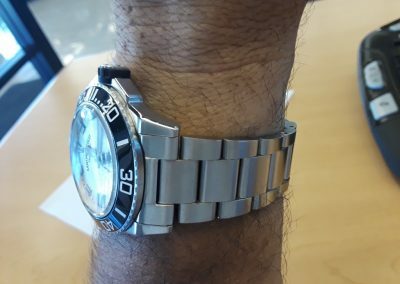 The watch by my measurements is about 45mm in diameter, 49mm across the crown, 13mm thick and has a 24mm lug width bracelet that tapers to 20 mm. The watch is a fairly large 52mm lug to lug. 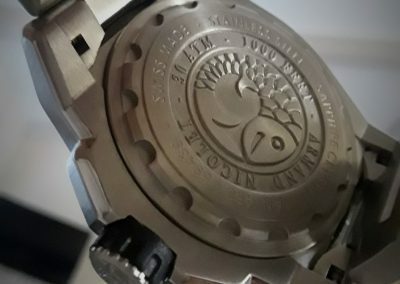 The company name and city (Tramelan) are printed on the upper half of the dial and the 1000 feet/30 ATM rating and “AUTOMATIC” are printed on the lower half of the face in a type size and style I find totally in touch with this watch’s design. Incidentally, Tramelan, Switzerland is primarily a French speaking municipality in the Canton of Bern that dates back approximately 850 years where watch making has been since the beginning of the 18th century. 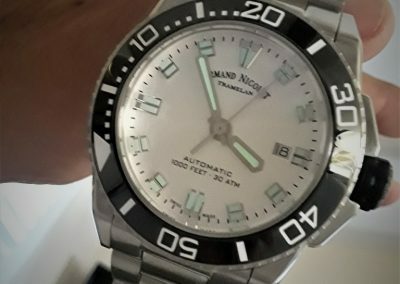 Though the area suffered a decline in the 1970s it has come back since the 1990s and Armand Nicolet is the biggest watch manufacturer in the area, whose population is roughly 4500 to 4600. The white on black ceramic bezel is 120 click, unidirectional and has a very precise feel to it. 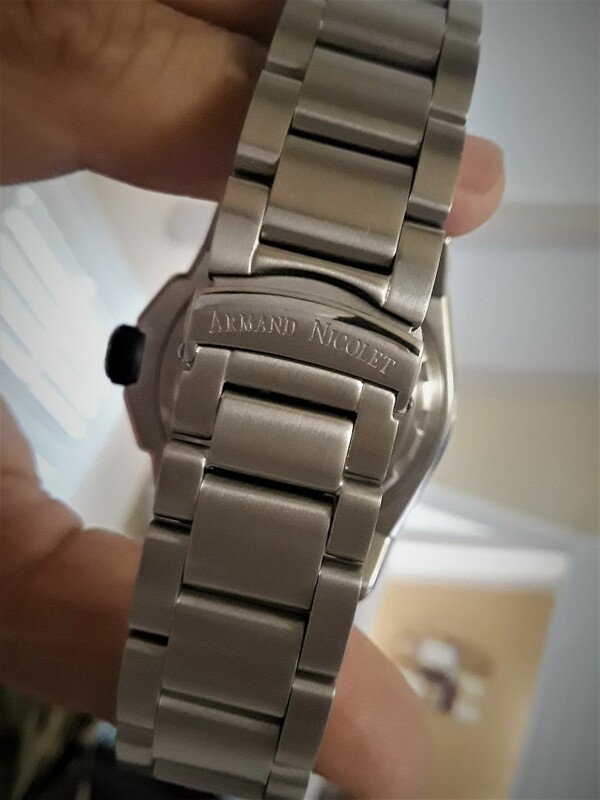 It lacks a lume dot and has minimal grip on the bezel edge, but quality and finishing is excellent. The beautifully signed gear edged silver 3 o’clock crown is encased in rubber, which is total overkill but gives the wearer a very comfortable grip when it is being used. The crown stem is very robust and has a rubber gasket which partially helps explain the watch’s 1000 ft water resistance rating. The watch hugs the wrist well, is comfortable and exudes quality. Large elongated crown guards are machined into the watch case which has an angular profile with polished edges on an otherwise brushed case and bracelet. The bracelet is completely solid, well finished and heavy with some very serious screws in the removable links. These links require two screwdrivers to be removed and installed. The butterfly clasp is completely milled with beautiful engine turned accents and a very nice signed flip lock clasp. 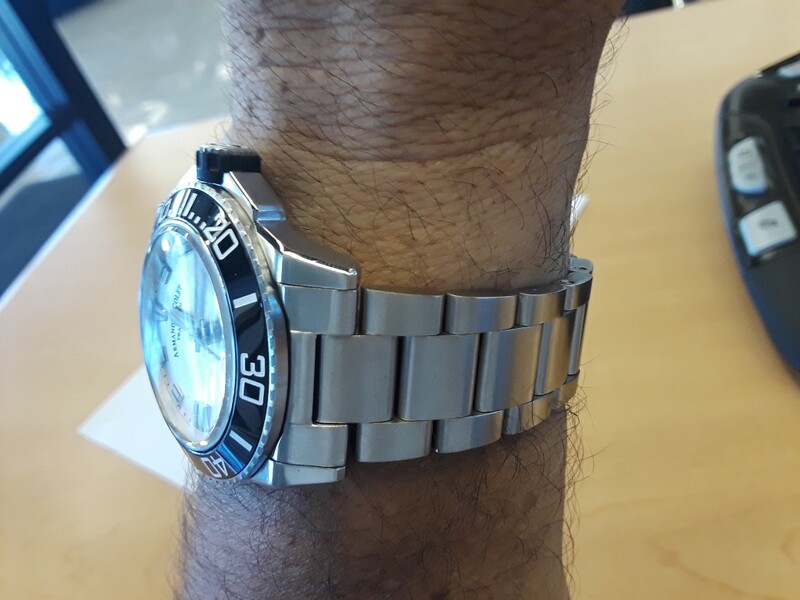 This type of clasp is rarely found on dive watches but I think it is appropriate to a dress dive watch like this. The machined and engraved screw down case back is stunning. Surrounded by sixteen machined semi circles to attach a case removal tool, the back contains machining and casting details that are absolutely superb. The fish in the middle of the case back looks like a piece of art that few people will ever see. Attention to detail really stands out on this watch.